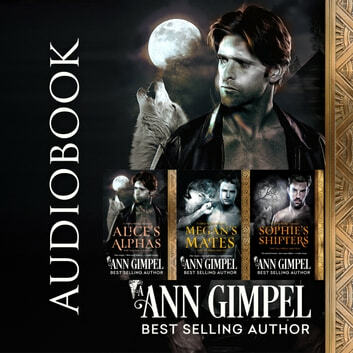 This audiobook contains all three Wolf Clan Shifter books. A poor route choice strands Alice - lost, hungry, and scared - next to Lon Chaney's cabin the Sierra Nevada Mountains. When Jed melts out of the shadowed darkness, she adds him to her list of problems. At first, she declines his offer of help, but he keeps talking until she ends up inside a cozy log cabin in front of a roaring fire. His skilled hands and a shot of whiskey heat her blood to molten, and her carefully tended world explodes into desperate hunger. After witnessing what might have been a murder, Megan is frantic to escape the Garden of Eden cult, so she catches the night train north out of town. Her lifetime commitment to the cult may be her death sentence, but she's not sticking around to let them frame her. Wolf shifters, Les and Karl, eke out a primitive existence on the flanks of the Canadian Rockies. Between hunters who want to kill them and a wildfire raging out of control, they're glad when Jed, their clan leader, shows up. And even more delighted when they see who's in his car. The winds of change are blowing as shifters gather in the Sierra Nevada Mountains for a war powwow. Tempers run high as they argue their next move. An unexpected attack forces their hand, and Blake, alpha for the coyote clan, fights alongside his brothers. He's grimly pleased when every single one of their enemies is finally dead, the bodies chucked into glacial crevasses. Sophie Laughing Wolf tracked her hated brother into the mountains. Gifted with foreseeing, she wants to make certain he ends up just as dead as he was in her vision. When the large group of men he's with are set upon by shifters, mythical dual-natured beings who can take animal forms, she hides, calling on earth power to shield her. Except it doesn't work.